The Ultimate Authority on Blackjack Today. Welcome to BlackjackTournament.org, the #1 resource on the Internet for Blackjack tournaments. We were compelled to create this site after searching the Internet for information about Blackjack tournaments and finding it lacking. Most of what we found didn’t really apply to the tournament form of Blackjack play at all, so we did our own research and created this site to share the information with you. We hope you enjoy it. Please bookmark this page and come back often for additional updates. Playing in a Blackjack tournament is quite different from sitting down at a table in your favorite casino. Instead of playing only against the dealer, you must also play against all of the other players seated at your table. The objective is not simply to finish up with more chips than you started with, but to be a chip leader throughout each round of play. On this site, we explore all of the aspects that make playing in these types of tournaments so unique. 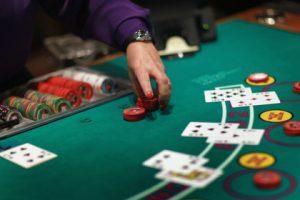 If you are new to the game, you will find sections to help you understand the history of the game itself, how to blackjack odds, and all of the etiquette involved in playing at a live Blackjack table. Those who have a bit more knowledge of the game will discover a useful section on card counting. There is another on how to pick the best table in the pit area. These contain tips that any player can take immediately to the bank. And there is even a section on setting up your own home game (similar to a poker home game). The majority of this site, however, is dedicated to tournament Blackjack and assumes that you already have a fair bit of experience at the tables. Knowing basic strategy, memorizing the play chart for multiple-deck Blackjack, and being familiar with some betting systems may come in handy. But as you will see, successful tournament play depends on taking risks one would never attempt in straight games. Take a good look at the section about different types of tournaments. There are many formats, not just one. You’ll also want to become familiar with tournament rules. Knowing how a tournament is conducted, what’s allowed and what’s not, is critical to making it beyond the first table and into the money rounds. We go into some detail regarding additional tournament strategies and other tournament tips gleaned for top players. Some of the information provided may seem contradictory. That’s because there is more than one way to win a blackjack tournament and each player must adopt an approach best suited to his/her personality and style of play. Another aspect of blackjack tournaments given special treatment here is risk management. Slow and steady doesn’t always win the race. There are times when a player must make a dangerously high bet to catch up to the leaders or stay on top of the chip count, especially during the last several hands of a round. There are times to lay low or sandbag, too, relying on the dealer to draw well and eliminate opponents. The section on Elimination Blackjack sheds light on this increasingly popular version of tournament Blackjack, while a retrospective on the Ultimate Blackjack Tour provides insights into the professional level of play. No stone has been left unturned in this unmatched presentation of playing in Blackjack tournaments. As blackjack tournaments expand and become more prevalent, opportunities will arise for those who specialize in particular versions of the game. With this in mind, we have compiled a series of introductions to nine of the most popular and innovative types of Blackjack variations. We will also attempt to list the best real money blackjack games you can actually play at on the internet! We begin with the classic—single deck Blackjack—and cover all of the basics. Every other version is rooted in this game. Then we cover the more exotic forms, from European Blackjack played without a hole card to Match Play 21 and Spanish 21—two different games played with a 48-card deck containing no 10s. Attention is also given to a coupler of new, up-and-coming casino favorites, too—the single-deck game called Super 21 and the side-bet heavyweight known as Perfect Pairs. One section deals with the nuances of playing Double Exposure Blackjack, with both of the dealer’s cards showing. Another takes up the topic of Blackjack Switch, which allows cards to be swapped between two separate hands. Here is even a section on Pontoon, the English staple that’s characterized by its aggressive doubling rules. The more a Blackjack tournament player knows about all varieties of the game, the more likely he/she will be to see opportunities that traditionalists and even strict card counters will be blind to. 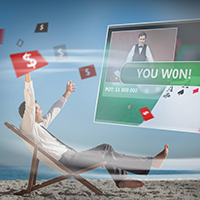 Winning at tournament Blackjack requires thinking and playing well outside the box. It is out hope that you will gain from this site all of the tools you need to go on to Blackjack tournament victory after victory.